Barry Lord, visionary founder of Lord Cultural Resources, has come a long way from the backstreets of Barton and Kenilworth in Hamilton. After studying philosophy at McMaster University he won a Woodrow Wilson Scholarship to further study at Harvard. Following that, he began working at the National Arts Centre in Ottawa. Through dogged determination and a 'non-institutional' McLuhanesque mindset, he soon launched an enviable international career as a museum consultant, high profile cultural planner and public arts provocateur with business offices in New York, London and Toronto. Recently, Barry Lord has launched a densely-packed 'idea' book, entitled Art and Energy: How Culture Changes, published by the American Alliance of Museums Press. Illustrated with 60 colour plates ranging from cave paintings of now extinct euro-bison to a large format photography of a rambling tire dump in California, the contents inventively link the course of history to the energy sources that made cultures possible. "Stewardship of the Earth, and the body," claims Lord, "is now the cutting-edge culture in the arts, and in our lives, that accompanies new renewable energy sources." The emerging culture of stewardship, he continues, "must do battle with the remnants of the culture of consumption that was brought to us by the still dominant energy sources of oil and gas." Provocatively and convincingly, Lord details the 'leaps' forward, as well as the cultural mindsets that hold any progressive innovation back. Since humans mastered fire, major cultural shifts have accompanied each energy transition throughout the ages. As example, a culture of anxiety continues to linger associated with our inheritance and dependence on nuclear energy. Contrast the somewhat euphoric culture of transformation that came to us during the era of electrification. That period was built on the culture of production, a result of the Industrial Revolution that was built, initially, on the released energy of the coal that produced steam. Lord argues that our increasingly volatile 'energy debate' is really about a conflict of cultures: one ending, one emerging. "Why does culture change at all?" he somewhat rhetorically asks. When we understand that "energy is the source of all Life and that all our cultures depend on Energy, we realize we are in a relationship of dependence with any given source of Energy." Every energy source carries an inherent set of values that establish how we live. "As each energy source becomes dominant, which is to say we become dependent on it, then it's values are universally accepted. Nobody talks about them anymore. They are mostly unconsciously accepted everywhere." Thomas Edison, as example, with the invention of his light bulb in 1879, changed night into day. Equally, air conditioning changed indoor climate. As a consequence of these inventions, our cultures changed. Now, with the advances of electricity and wireless digitization, former physical and knowledge boundaries are rapidly dissolving around the globe. These remarkable advances have developed our confidence that "we can change the world." What must be understood is that "every energy source is not culturally neutral." Oil and gas, as energy sources, created a culture of consumption - unlike coal, which generated a culture of production. Cultural habits of "shopping at malls" is a result of the effect of oil and gas. Primarily a knowledge-based industry dependent on geology and engineering, oil extraction is not as labour intensive as coal. Once the rig is set and the oil gushing barrels can be shipped wherever. Thus, the nexus of value shifts from heavy labour production to rapid market consumption. Worth noting, the first universal credit cards were credit cards for gasoline. It was the credit card companies that saw and established everybody as consumers. Until very recently, in Western civilizations, the culture of oil and gas, aka the culture of consumption, has remained dominant. It depicts a future of unending abundance, a cultural value, that has remained unchanged and unchallenged for decades. Yet, the emerging cultural values of renewable energies - producing an alternative culture of stewardship - provide a momentous possibility of harnessing non-fossil fuel technology to give us the energy we need. We no longer have to be dependent on fossil fuels. According to Lord, "That's a huge cultural shift." Germany is way ahead of everyone else on this, as is Denmark. Changing our relationship to energy, and by extension developing a new participatory culture where we are both producers and consumers, we now have the possibility, through the revolution of renewables, to turn every building into a producer of energy. We are in the early stages of the emerging culture of stewardship, where our fundamental values are and will be changed by the incoming values of renewable energy. It goes without saying that we need greater support of renewable energy to move wholeheartedly into this emerging culture of sustainability and stewardship. Big Oil continues in the dominant position, maintaining the pervasive manners and mores of the culture of consumption. Renewable energy is in its infancy with fundamental problems, like: how do we store it? The pervasive and now global culture of consumption has led to a lot of anxiety because of the increasing intergenerational clash of cultures over energy sources that, in and of themselves, have conflicting values. 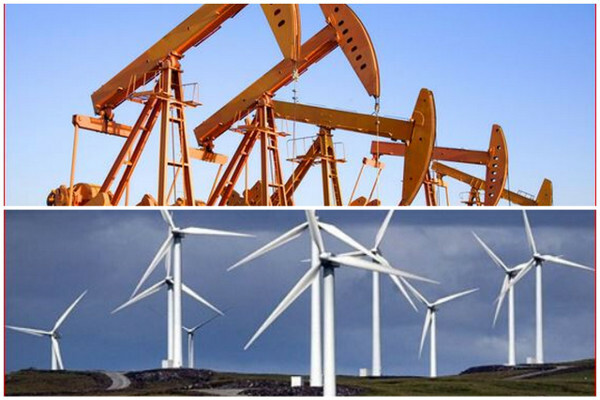 Oil versus Green has now become a generational issue. Truth is, the production of energy today that we all use to power our private and public spheres has slowly been taken away from us. So much so, that most are now at the mercy of the one-way grid, a power distribution system controlled by governments in collusion with mammoth private and public corporations, banks and global markets. Renewable energy owned, managed and distributed by local co-operatives that feed back into the grid, have been and will continue to systemically transform our cultural values from a combative, consumptive, anxiety-riddled culture to a culture invigorated by participatory stewardship of our planet, and of ourselves. Renewable energy offers hope for all life's survival. 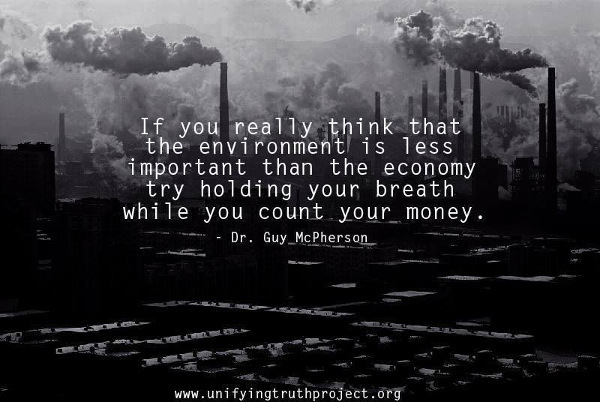 Big Oil and fossil fuels do not. Cultural clashes arise whenever the dominate culture is challenged by an emerging culture. We are in such a transitional period today. Okay, preamble finished. So what does this have to do with voting in municipal elections? It is very worrisome that upcoming important local initiatives will be instituted by government agencies that are not endorsed by the majority of the local populace. We have just instated or re-instated municipal governments in the Golden Horseshoe region that have been recently elected by less than 35 percent of eligible voters. Consequently, our local governments will respond to vested 'stakeholders'. These stakeholders invariably voted to have their particular interests protected. This creates a very lop-sided representation and 'closed system' of 'taxpayers priorities' when municipalities roll out their p.r. machines. In simple truth: if we do not vote, we severely undermine our own capacity for self-determination. For those who claim The system is corrupt, so why bother voting?, I respond, the system is corrupt precisely because you do not bother. In order to reclaim a functioning and participatory democracy, taxpaying citizens must weigh in with more then just their taxes. We must vote! We must re-engage with the issues of the day. We must challenge status quo Official Plans. We must research alternatives, and, if necessary, run for office. Only then will we attain the representation that realistically and adequately reflects the diversity of circumstance - and opportunities - within our respective municipalities. It is, fundamentally, our duty to engage, as active local citizens, within the broader global community of humanity. If we don't engage, we leave ourselves in the hands of self-perpetuating political bureaucrats, who, legally, have access to the public purse to create a future that buttresses the vision of those who have put them back in office. That said, there are innumerable public and private initiatives emerging to remedy the growing disparity between those who govern, and us, the governed. We can do this. Take your pick, and get involved. Push for the change that you want and seek. Do it for yourselves: do it for your children. Do it so that our species can survive - and thrive - on this ever generous life-giving mothership. Yes, it is imperative that we collectively understand what we are up against. Crude Oil production in the USA has tripled in the last four years. The current Canadian Government is bringing in billions of dollars worth of tax revenue from investments in the Alberta tarsands. Meanwhile, provincially, Ontario is trying to get liftoff with a renewable energy package that places a substantially heavier tax burden on households. We need leaders like Barry Lord to keep our spirits up. Artists too can lead the way. Arte Povera began exploring this new stewardship by salvaging or recycling found objects, as early as the 1960s. Daria Fo's theatre in Milan began exploring participatory satirical theatre, working off newspaper headlines. Earth Art, also known as Land Art, is now a familiar phenomenon, unheard of a mere 20 years ago. Mariana Abramovic performance art at MOMA, The Artist is Present, manifests this new stewardship by demanding attention, not to what she has produced with her hands, but to her body. She sat on a chair for 8 hours a day, giving 10 min 'sessions' with members of the audience, eye to eye, no talking, no words. Audience reactions were strong and emotional. Many spoke of an "awakening of self". Understanding this basic presence of the body equals an emerging understanding of the stewardship of the Earth. Singer and songwriter Neil Young has recently linked environmental issues to the Rights of Native peoples in Alberta. He manifest the emerging culture of sustainability and stewardship by associating his personal art form with the plight of a people's direct affiliation with the planet. Margaret Atwood, famed Canadian author, has lent her voice to the Future Library public art project, where authors compose works to be published 100 years from now on pulp from trees planted today. To conclude, consider the lead-by-example of Barry Lord (and his wife Gail), who returned to Hamilton in the early 1980s to take on three significant projects: the commissioning of Westfield Heritage Village, the restoration of the steam engines at the historic Hamilton waterworks and the initial studies into the possible raising of the Hamilton and Scourge 1812 warships. Barry Lord got down and dirty. Another person who understands this transitional period is Naomi Klein. In the next video, she discusses her new book, This Changes Everything: Capitalism vs the Climate. "I'm inclined to think elections are overrated. If you vote for a candidate once every four years but don't get involved in the meantime, it doesn't really matter much who you vote for. Once politicians get inside the bubble, it's impossible to keep any kind of perspective without ongoing, substantive interaction with 'regular voters' for grounding. Which is why it's so important for citizens to: a) elect councillors who will allow themselves to be engaged, and b) keep up their end of that engagement between elections." As much as I have fervently yammered on over the past few years about the importance of informed ballots cast as opposed to simply increasing turnout, I'm finding myself more and more questioning the decision-making process for those who vote beyond name recognition. To whit: Why did you choose the Ward candidate you voted for? What was this decision based on? What were the differences between this candidates and those who didn't pass muster for you? I ask these questions simply because of the nature of Municipal governance, where, in the main, no Councillor possesses the power to have their 'agenda' put into play. So most declarations can be seen as 'strategic platitudes'. So does it really come down to simply how comfortable we feel with a particular candidate? More and more, I believe what Ryan proffered to be of immeasurable value...mostly because it places the responsibility for good governance where it should be: on the resident. After all, we are the employers in this scenario, and Councillors and the Mayor are our employees. It's up to us to guide them in leading us. "You don't ask, you don't get." At best, good governance is an 'on-going dialogue' between elected Councillors and their Ward constituents. But if we don't vote, we don't have a leg to stand on. There are other ways, of course, to become engaged within our communities at the grassroots level, but the 'lead time' is generally longer and the results usually less visible. Municipal governments are multi-million dollar corporations. If we are moving in the same direction, their resources can and should amplify residents preferences. If we don't vote, or engage, we remain 'governed' - without representation. Since the advent of time-of-use billing in May 2006 to April 2014, on-peak rates have risen 23% (or 2.4 cents per kw/h) from 10.5 cents to 12.9 cents per kw/h (23%) while off-peak rates have risen 105% (or 3.7 cents per kw/h) in the same period — from 3.5 cents per kw/h to 7.2 cents per kw/h. Love the cartoon and isn't that the point. 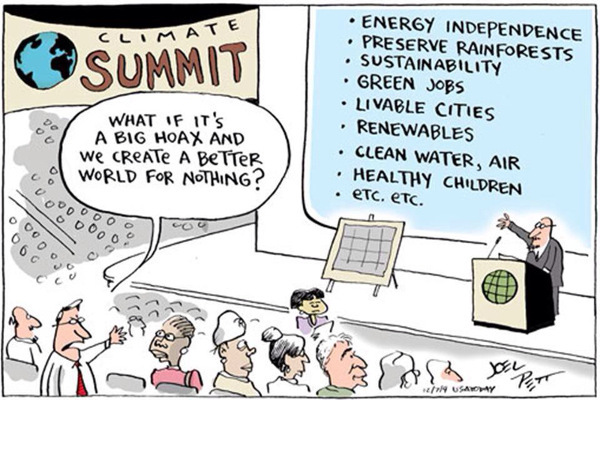 Who cares if climate change is not man made or even if there is any change outside of the "norm." Waste is waste. Curiously, I see in The Spectator that 15 activists took a stand when an oil executive was on the podium at McMaster University recently. It may not have been the 'best place' or even the right kind of action, BUT, it was a 'stand taken'. That act is a clear example of the "battle" of cultures of which Lord speaks about above. It's playing out too south of the border with Keystone XL and in the west of Canada with the Northern Gateway pipelines, and locally, with Line9. A new consciousness, a new awareness, a new sense of 'stewardship' for the planet and for ourselves is challenging 'the norm'. Good thing. Amazingly, this analysis faces opposition not only from the anti-environmental right but also from analysts on the left who are committed to radical "degrowth" and fundamental changes to the global economy - the "This Changes Everything: Capitalism Vs. The Climate" position, to borrow (a tad unfairly) the title of Naomi Klein's new book. Particularly with this statement, "If we ever get past the special interests and ideology that have blocked action to save the planet, we’ll find that it’s cheaper and easier than almost anyone imagines." It has been repeatedly proposed by those 'on the left' that the best way to usurp "the special interests & ideology" is to a) have 'Polluters Pay' and b)legislate compliance. When new measures were brought in to curb auto emissions, as example, there was, initially and predictably, squawking from the auto industry, but today, with the on-going raising of public awareness and legislation, the 'race' is now on to design the least polluting vehicle ... Emissions testing is now de rigeur, something unheard of a mere 13 years ago. The same thing needs to be done for cultivating decentralized renewables. Part of the problem with the German 'model' is the over-zealous intervention on behalf of the government. Solar energy is subsidized, but manufacturing of solar panels is not. So, energy providers purchase low-cost panels from China, thereby undercutting the 'innovation' of manufacturing jobs for the local economy. From that article: "Under that “feed in tariff” (FIT) program, ... owners will receive 44 cents a kilowatt hour for all the power it generates OVER THE NEXT 20 YEARS (caps mine), about three times more than the retail electricity rate of less than 14 cents a kilowatt hour." The FIT program was suspended in 2013, but the RATES are locked-in. Not surprisingly, a number of 'new owners', mostly cagey investment funds, have bought up or bought out businesses because the GUARANTEES are there. This 'bad deal' for taxpayers is essentially a result of too much government intervention. US & China strike historic deal on carbon cuts in push for global climate change pact ...Wonderful News, no? YET, Mexico's state owned petroleum company, Pemex, (http://en.wikipedia.org/wiki/Pemex) just inked a $10 BILLION credit line with China's state oil company CNOOC, and financial institutions - China Development Bank (CDB) and ICBC ... Um, not so good. Lozoya Austin, CEO of Pemex, "stressed the importance of these agreements for economic growth and job creation in Mexico." Moral? Stay ever vigilant and PUSH for LOCAL government to be responsive and responsible to LOCAL constituents. Be every leery of global investment bankers (including state-controlled bankers) whose primary goal is 'profit' - not clean air, water, soil and/or good husbandry of humanity and natural resources. This is an excellent article. Lord's book was also favourably reviewed in a past People's Voice newspaper. Thanks, Lindsay, for writing this.